Quick Summary of Lightning-Fast German for Kids and Families. No time to learn German? Want to teach your children but don't speak German yourself? Lightning-Fast German helps you incorporate German into your every day activities, so you learn while doing the things you already do. You'll teach your children German the same way you taught them English - by interacting with them as you do daily activities. No need to set aside extra time in your busy schedule, and no need to speak German yourself - with this unique program, you both learn as you go. You'll be amazed at how quickly you see results! Lightning-Fast German for Kids and Families offered a different approach to language learning. When I initially learned Spanish--I learned vocabulary words and then slowly over the years learned to create sentences around my learned vocabulary. I still remember many of the words that I memorized--but, cannot use them in sentences since I stopped practicing the language in college. The Lightning-Fast books encourage full sentence practice from the beginning--while learning the vocabulary. The books take daily situations (like choosing meal options or sorting laundry) and create language lessons around the activities. The intention is that families can incorporate the language lessons more readily into everyday activities. 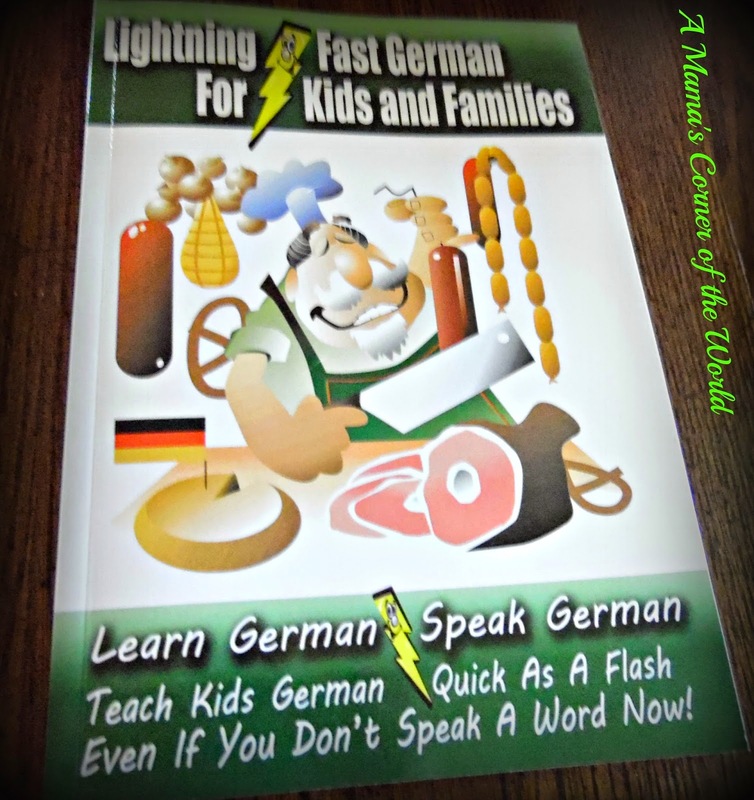 What did we think of Lightning-Fast German for Kids and Families? My family personally enjoyed the games and extra activities (such as the scavenger hunts and treasure hunts). Those helped us reinforce common question phrases and vocabulary--while spending some unique quality time together. We all felt that a CD with at least some of the pronunciations would have helped us since none of us have any German speaking experience. We found ourselves "guessing" a bit--feeling unsure that we were saying things correctly.....and not wanting to learn things incorrectly and reinforce mispronunciations. The language pronunciation keys help--but, I think we all needed to hear the correct sounds from a speaker a time or two for confidence. Would we recommend Lightning-Fast German for Kids and Families? I think this book does offer a fun way for families to add instruction for a second language to daily activities. Since the book can be used during a variety of daily tasks--the content could certainly be repeated and reinforced toward mastery. As a family; however, without any German language practice or experience, we felt that we needed to hear the words spoken verbally to feel comfortable practicing them. I would love to see audio versions of the book or an audio supplement covering at least the basic pronunciations. The book series is certainly worth a try for busy families. The series contains other language options as well, including French, Spanish and Italian. Carolyn Woods is a work-from-home, single mom of 4, always trying to find more efficient ways of doing things so she has time for the fun stuff! She's written books on teaching your family new languages while you are running errands or doing household chores. She also has a new guide on work you can do from home when you also have children to take care of.